Every once in a while, I feel the need to get out of London and explore more of the UK, as this country boasts beautiful towns, villages, and landscapes that I just cannot get within Zone 1. I love visiting Edinburgh and St Andrews, and I’ve had a couple of wonderful experiences in the Wirral, but this time, I was angling for a train journey under two hours, in order to make the most of the weekend. I was also meeting up with a dear friend, who lives on the other side of this vast country, and so we opened Google Maps and figured out a good halfway point. “Salisbury?” he suggested. Despite having recently gained notoriety on a global scale due to a political scandal, I knew the town itself is meant to be absolutely delightful, and what’s more, the cathedral had inspired Ken Follett’s Pillars of the Earth, one of my all-time favourite novels. So, why not? 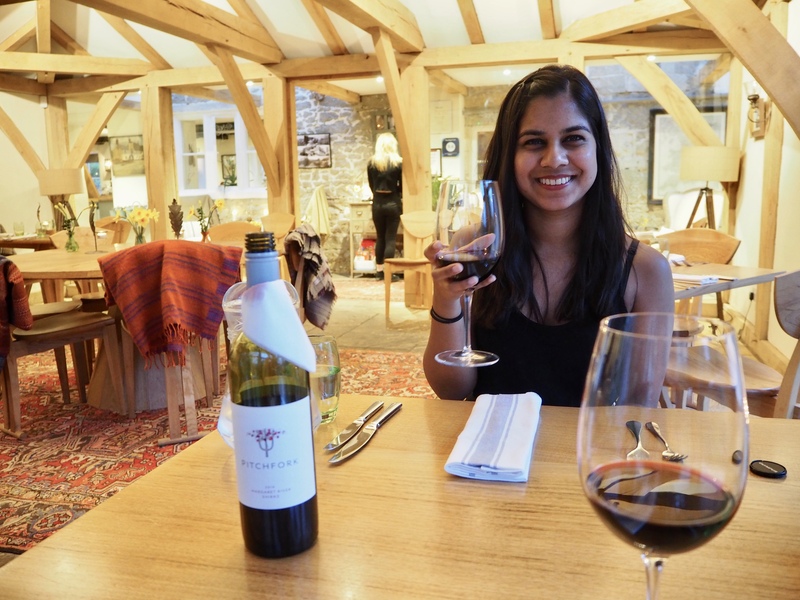 We decided to stay in a countryside hotel for the night before exploring Salisbury the next day, and after a bit of research, we landed upon The Royal Oak Swallowcliffe, a gorgeous pub and hotel just a short drive from Tisbury. The Royal Oak has a rich history, having been a functional inn since 1852, but its recent renovation has put it back on the map. 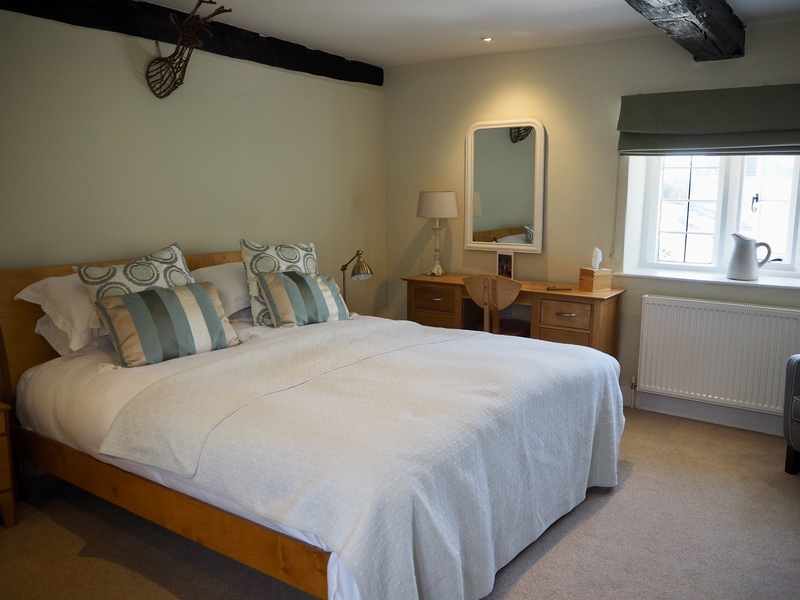 Whilst the charm of the thatched roof, stone fireplaces, and exposed wooden beams remains, our room (and especially bathroom) were wonderfully modern. 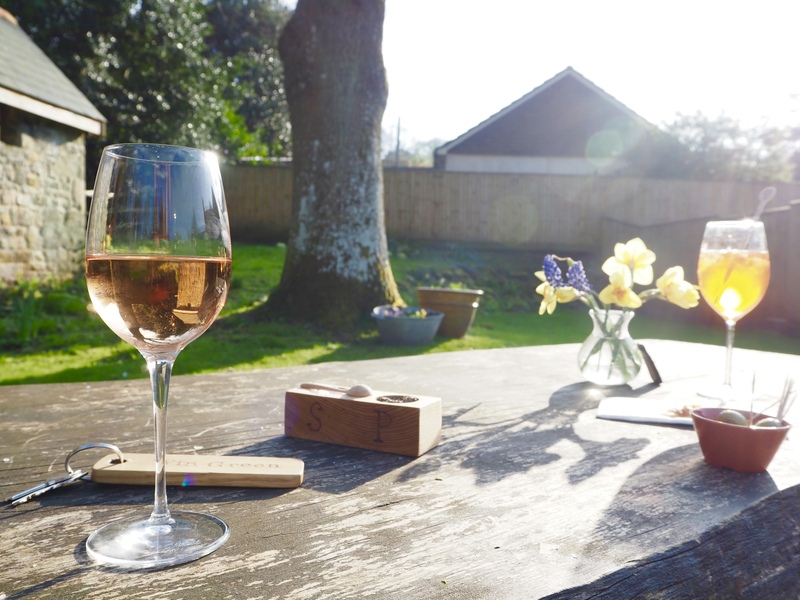 There is a lovely garden area, and as luck would have it, we visited during the ‘summer in April’ weekend in the UK, with scorching temperatures, and so we went for a short walk in the surrounding fields before soaking up the sunshine (and some wine) in said garden. But enough of that, let’s get to the food! Head chef Michael Smith joined the team quite recently, and has trained with several master chefs including Gordon Ramsay. 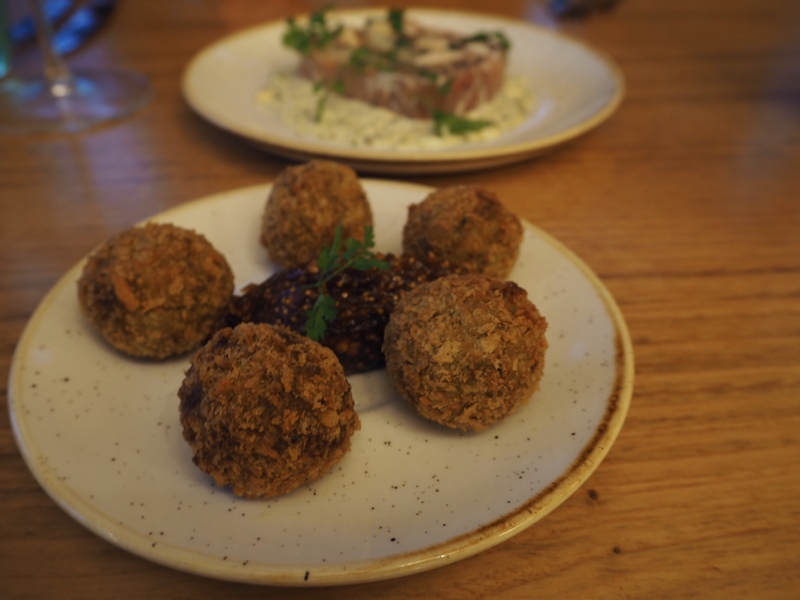 He’s definitely made his mark with the Royal Oak menu, starting with the day’s special of goats cheese and wild garlic arancini, which were incredible – perfectly fresh, soft on the inside, and crispy on the outside. The fig chutney it came with was almost fudgy, but it also had a slight warmth from a hint of chili. I normally find arancini too stodgy, but these managed to stay light with the garlic and cheese flavours combining in a crunchy mouthful. The chicken and wild mushroom terrine was a very different experience, as the slice was loosely packed together, rather than how I’m used to having terrine, which made it feel like it had been put together behind the scenes a mere moment earlier. 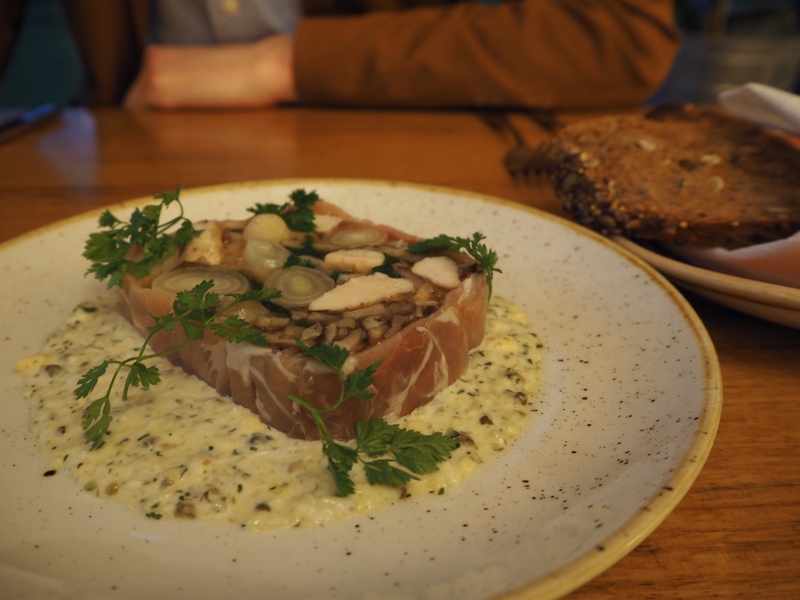 It was bursting with garlic chunks, shallot slices, tender chicken and soft mushrooms, wrapped in a ham edge, and when smothered in the gribiche sauce and spread on the toasted sourdough, it was heaven in a mouthful. Throughout the meal, we intoxicated ourselves with a 2014 Australian Margaret River Shiraz, which matched the dark meats very well with its plum and cherry notes and light peppery hints (although my knowledgeable companion said he’d usually expect more pepper from a Shiraz). And then… the evening’s piece de resistance. 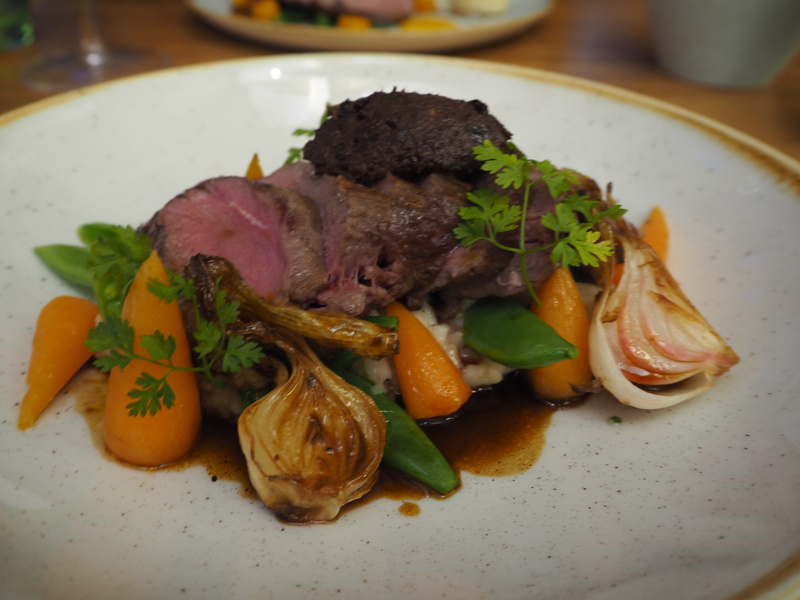 Lamb, on a bed of simple risotto, surrounded by roasted shallots, soft yet crunchy carrots, sugar snap peas, with an olive tapenade (!) that did not shy away from anchovies. It was bold, it was British, it was flavourful. One of the best dishes I’ve had in recent memory. Unfortunately, our second main, the duck, did not quite measure up, though this may have been due to the sheer superiority of the lamb. 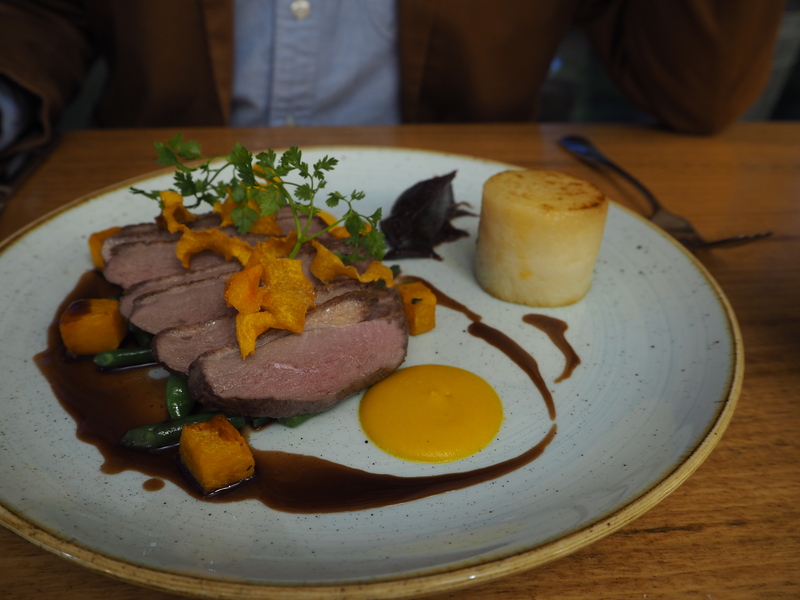 The duck meat was slightly overdone, and the fondant potato a wee bit stodgy. Nonetheless, the squash purée, cubettes, and shavings were delicious, and the date purée was an excellent addition. And the presentation, as with the other dishes, was on point. And how could I forget the fries we ordered on the side due to pure indulgence… perfectly crisp, salted, and moreish! 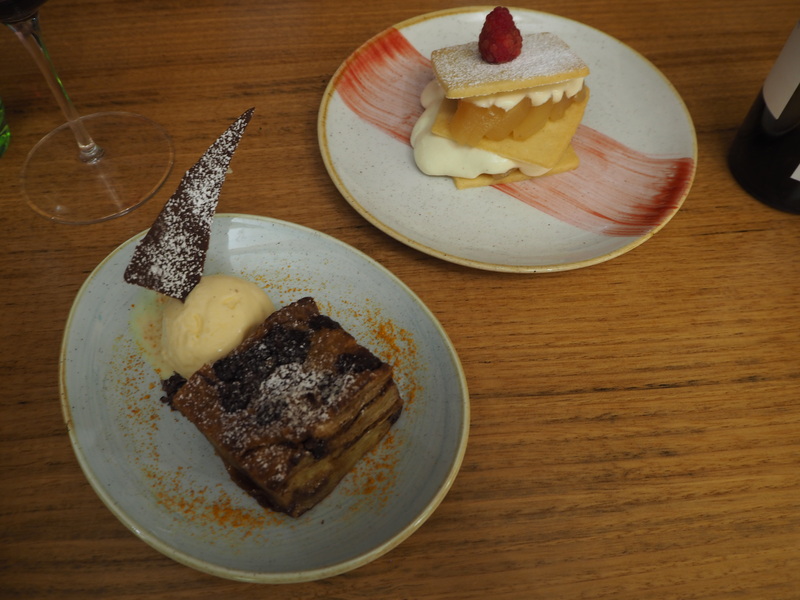 The portion sizes for the mains were very generous – I think any restaurant in London that produces food of this calibre would only have given us half the amount – and so we were already quite full, but couldn’t resist dessert. The pear sabayon was mildly sweet and perfumy, with great crisp shortbread – I wasn’t overly excited by it, but it was light and fresh choice. But it was the orange croissant bread and butter pudding with chocolate sprinkles throughout that pushed me over the edge – it was a taste explosion and worth nearly bursting out of my dress for! 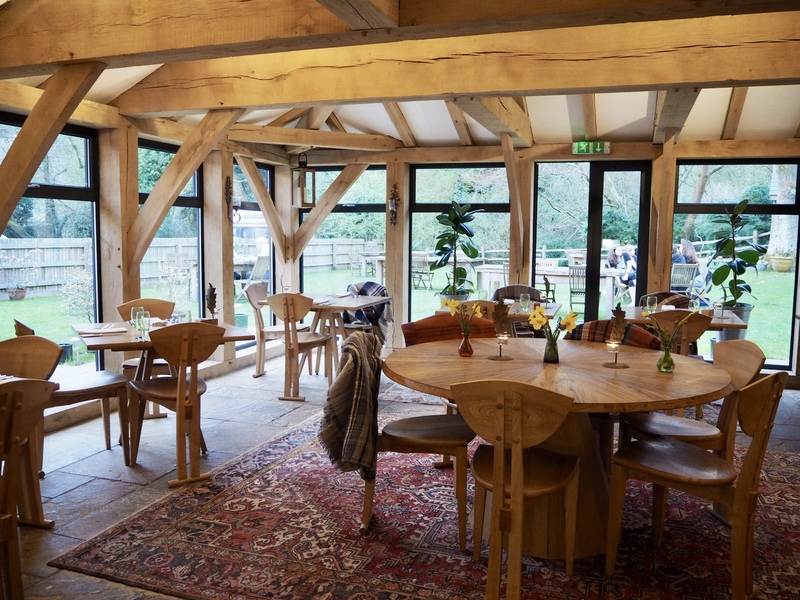 Sitting in the conservatory, listening to the thunderclaps overhead, imbibing the bold flavours, and chatting to the friendly service staff made for an absolutely delightful evening at The Royal Oak. I also loved how we could then tread the 15-second path back up the room and collapse into bed immediately! 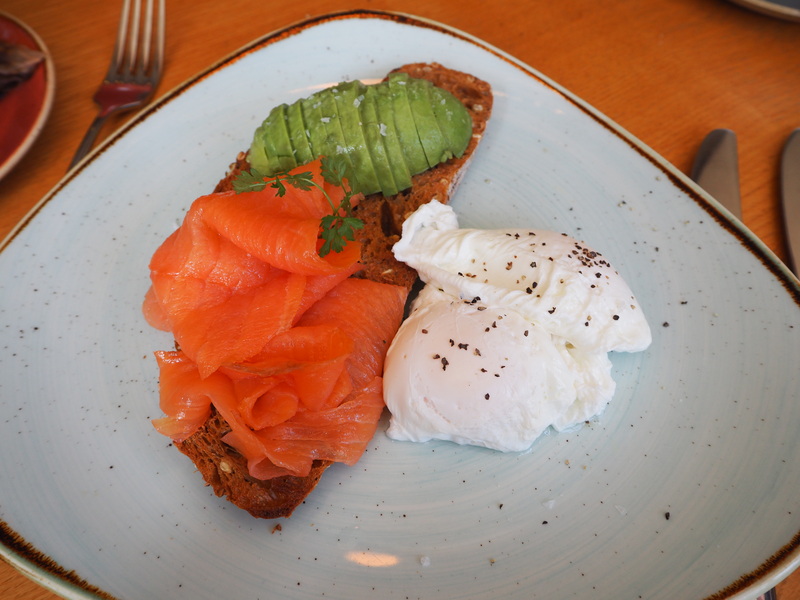 The next morning, we enjoyed a lovely breakfast before taking up the waitress’ advice and driving past Stonehenge rather than going inside (the view was more than ample). 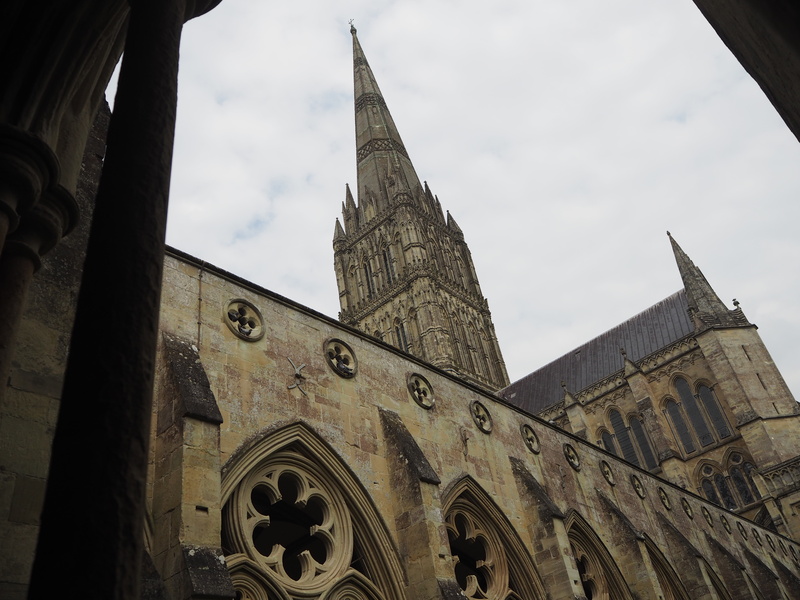 We then headed into Salisbury, enjoying a sunny afternoon and a visit to the breathtaking cathedral. Although the entire trip was only about 24 hours, we saw, did, and ate so much, yet felt utterly relaxed. 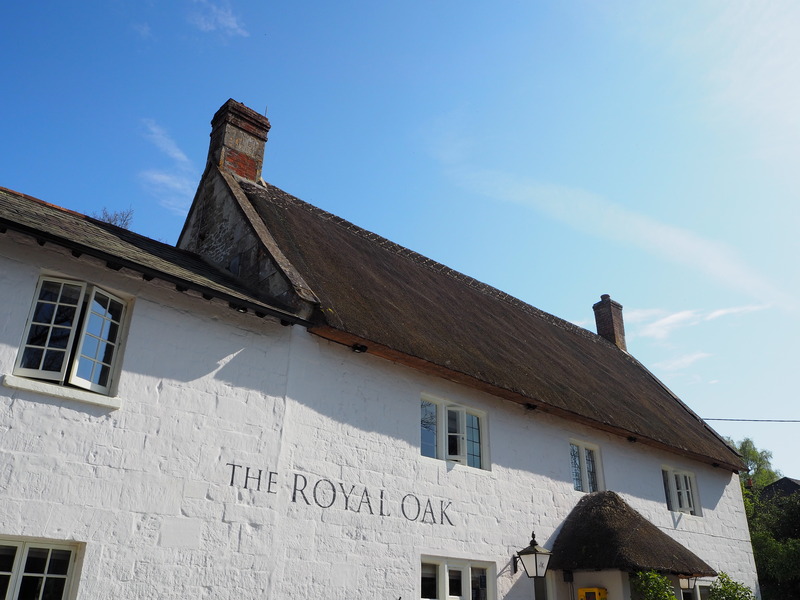 The Royal Oak is a wonderful getaway from London, and with a sub-2 hour journey, excellent food, lovely rooms, and stellar service (perking up our water bottles with a slice of lemon was just one of their ways of showing it), I highly recommend it as a charming and quiet weekend away. And if you can, definitely combine it with a visit to Salisbury; a quaint town with a stunning cathedral. The Royal Oak did not charge me for dinner, but we paid for our drinks as well as the overnight stay. As always, all opinions are my own.